The previous post on this blog covered efforts by Environmental Progess Illinois to save nuclear plants in that very tough market space. Now, coming up in just four days, there'll be a march in Chicago to try to pump up attention for this important cause. You can see the previous post here, if needed for background on this very important effort. WHAT: Protest March and Rally at Invenergy and Environmental Law and Policy Center. CHICAGO -- On Monday, October 24th at 11:00am, independent pro-nuclear environmentalists will march, rally, and sing in support of provisions in the Next Generation Energy Plan (NGEP) that would allow for continued operation of Clinton and Quad Cities Nuclear Plants. Illinois legislators could still act in a “veto session” after the November 8 elections to save both plants as part of a package deal that includes generous subsidies for renewables and energy efficiency. The march is being organized by the Clean Power Coalition, a new pro-nuclear environmental coalition consisting of Environmental Progress, American Nuclear Society - Young Members Group, Mothers for Nuclear, Thorium Energy Alliance, and the International Youth Nuclear Congress. 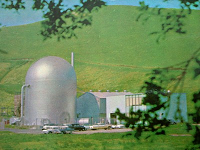 Coalition marchers will march on the headquarters of two organizations they view as hostile towards nuclear power — Invenergy and the Environmental Law and Policy Center (ELPC). The Clean Power Coalition is composed of environmental, academic, and industry organizations including Environmental Progress, Mothers for Nuclear, the International Youth Nuclear Congress, North American Young Generation of Nuclear, Thorium Energy Alliance, and American Nuclear Society Young Members Group. Environmental Progress is an environmental research and policy organization building a movement of citizens, scientists and conservationists advocating ethical and practical energy solutions for people and nature. or email us at info@environmentalprogress.org. We've seen in recent times the effects of closing nuclear plants before they're due to be closed by licensing or condition issues- more than once. Kewaunee. Vermont Yankee. Already on the list is FitzPatrick in New York. The effects on the local economies are clear enough, and so is the effect on emissions from the generation of electricity. 1. Favors short term profit instead of long term sustainable business. 2. Favors the popular public "cause du jour", which is renewables. The two plants named specifically have been Clinton and Quad Cities; Exelon has vascillated over whether to shut one or both, with Clinton (being a single unit) clearly far more at risk if the most recent reports are to be believed. Michael Shellenberger, who is co-founder and Senior Fellow at the Breakthrough Institute and one of the guiding lights of the Ecomodernist movement (which says very simply that if we are careful about our energy choices we can live the same high energy life we do now, and allow that to spread, without damaging the environment) has founded a group called Environmental Progress. That group will announce Monday, April 4 a new chapter in Illinois whose first job will be to ensure that none of the nuclear plants in Illinois is shut down. Shellenberger tells me that the reason to take action in Illinois is pretty clear. "If just two (Clinton, Quad Cities) of Illinois' six nuclear plants were shut down, they would be replaced by natural gas or coal and pollution would immediately skyrocket," he says. "Illinois' carbon emissions would increase the equivalent of adding TWO MILLION cars to the roads. If they were replaced by coal the carbon emissions would almost double." On the other side, keeping these plants open has a very clear positive effect on the environment - and on the citizens of Illinois. According to Shellenberger "If they run their full 60 year lives, Clinton and Quad Cities nuclear plants will prevent between 2,468 and 5,474 deaths from coal." It's important from a number of points of view to try to stop any and all nuclear plants from being closed while they're still operable if the reasoning behind that closure is a temporary economic situation - so I asked Michael why it's important to really try to draw the line in Illinois. "Illinois could be a model for the world in including nuclear in the state renewable portfolio standard," he replied, which of course is an issue that has some history behind it in that state. Further, Illinois is in a great position to champion the cause because of the contribution made already by nuclear which it would be protecting with such legislative action. "Illinois generates more zero-emission electricity than any other state," Shellenberger remarked. "Most of it comes from the state's six nuclear plants, which produce about half of Illinois' total energy and 90 percent of its low carbon electricity. These plants are in their prime and could stay in service many more years and even decades." Did you catch that? 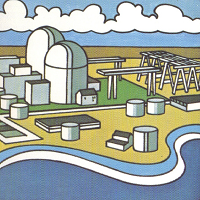 Nuclear is about half Illinois' power. It's 90% of its low-GHG power. Shellenberger will be speaking at a public event in Downtown Chicago on Monday April 4th at 7 PM in the evening. I would encourage anyone interested in the effort, or interested in attending, to follow this link to the American Nuclear Society's blog where you can read quotes from other participants and find the directions to attend. 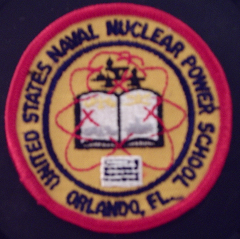 For those who just want the details, the Saving Illinois Nukes event is at Medill School, 303 East Wacker, Room 1600. This is downtown. The event runs 7 PM to 8:30 PM and will feature three speakers (James Hansen, Michael Shellenberger and Rachel Pritzker) followed by an audience interaction session. Let's hope this effort gets off on the right foot, to a fast start and has a strong finish. Illinois deserves it, and so does our air. Five Years From Fukushima: Where Are We Now? We find ourselves at many different places, all at once, five years after the event that changed everything. We see new opportunities, based on new ideas; we see some old places reawakening, all too slowly. We watch as a nation struggles with its economy and need for energy, as elsewhere the concept that "an accident anywhere is an accident everywhere" leads to deliberate, voluntary entering of that power short, and power costly world Japan was thrust into in the months following March 11, 2011. The world has indeed changed, and in many ways we might well have predicted these changes some time ago. The spread of publications heralding this five year anniversary will no doubt be considerable; facing that, my presentation here must be either exceedingly brief, or else exhaustive to the point of intolerability in order to have any real chance of contributing to the overall discussion. I shall choose brevity as much as possible over any attempt to document the thousands of personal actions, thousands of official report pages printed, hundreds of critical decisions made, in an attempt to reach some sort of bridge from then til now. It is not any stretch to say that the conditions at Fukushima Daiichi are very considerably improved, and of course one asks "how could they not be?" after the five years since the tsunami that flooded the site with millions of tons of water and debris. (Not to mention the destruction caused by the hydrogen gas explosions at Units 1 and 3, and the less forceful but still significant leaked-in gas burn at Unit 4.) The workers at first had to rush to the emergency - had to meet the need where it was. There was no time to consider anything but utility, access, speed. Over time, as the conditions of the nuclear plants made it clear that this would be not just a months but decades-long effort, TEPCO has moved to improve the accommodations for the workers as much as possible and actually, today, may be said to have afforded the legion of people, men and women alike, who are working at the site some identifiable measure of personal comfort. For a long time, the real cause of the Fukushima Daiichi accident has been known -- that cause being what the industry refers to as Station Blackout, or that condition in which no electric power is available to operate plant indications, controls or systems. The inundation of the site by the tsunami 46 minutes after the magnitude 9.0 earthquake (which the plants survived as they had survived other earthquakes, the operating units shutting down successfully and safely) caused the Station Blackout or SBO when the Emergency Diesel Generators and associated electric switchgear was flooded and made inoperable. Many arguments have raged about the siting of the plant, or else if not that the location of the diesels in lower levels of the plant, or else of the failure to provide diesels at higher levels or even not immediately at the nuclear units. Those considerations are, of course, specific to each nuclear plant site everywhere - and that is why, for example, Japan and the United States have chosen to supply large numbers of ready-use standby power supply and support vehicles which can be rushed to any site(s) needing them. 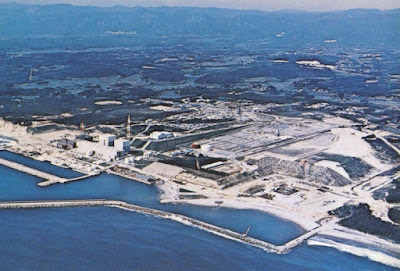 That the accident would have happened given only the tsunami, and letting dozens of possible scenarios play out after that, is almost unavoidable, although a sound case can be made that a serious tipping point was the hydrogen explosion at Unit 1 just after 3:30 in the afternoon on March 12. When that event occurred, attempts to connect portable resources to other units was interrupted, and people were literally forced to flee the area for a time for reasons of personal safety. (No substantiated claims of persons fleeing the site out of sheer fear have arisen, although the false claims continue.) After that interruption in site-wide operations it then became more and more likely that accidents would occur at other units on site, and of course there were eventually meltdowns at the other two units (2 and 3) which had been operating. Unit 4 oddly suffered the effects of a hydrogen gas explosion itself, not from the spent fuel (as was commonly assumed in the early days) but rather from gas leaked over from the stricken, neighboring Unit 3. It must be pointed out that all of Unit 4's spent fuel was removed intact last year, finally vanquishing those claims that it had been uncovered, had overheated, or worse. 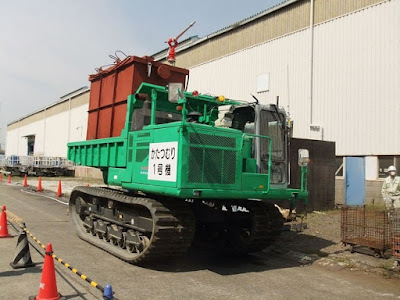 This customized, remote controlled tracked dumper is typical of the equipment used at the site in the early days. Note the television camera on the engine housing; vehicles were controlled from a special trailer or building. In the years since, TEPCO has continued to make various moves at the seriously damaged units to control their conditions. It has, for example, erected a huge enclosure around Unit 1 - - which it is now removing. It has removed rubble and debris from the refueling floor levels of Units 3 and 4, and is preparing an enclosure to get the spent fuel out of Unit 3's spent fuel pool. The appearance has changed drastically as the wrecked buildings and distributed materials are replaced with something still disordered, yet less otherworldly. Gone are the days of armored and shielded fork lifts, cranes and dump trucks removing girders and glass and crushed vehicles, only to be halted by discovery of a new hot spot; today, areas are mostly accessible on foot and buses transport workers around the site, on which full respiratory equipment is required less and less. In the months after the accident, there was no time to consider what the long run would be - who would be responsible for what, and what would happen to the owner (TEPCO), or the nation, or even what would happen regarding the nuclear regulator's actions. There can be no doubt that the accident was directly responsible for the dissolution of NISA, the regulator at the time, and the setup of a new nuclear regulator (Nuclear Regulation Authority) completely outside of the Ministry of Trade and Economy. Eventually, given the fact that all nuclear plants in Japan were shut down, and that every single utility had to scramble to get generating sources and fuel for those sources, it became clear that TEPCO would not be able to survive, and it more or less did not. The company has been receiving infusions of cash from the Japanese government, who now effectively owns it - in different circumstances, the company would have gone bankrupt. This of course almost happened to the owner of Three Mile Island, General Public Utilities, who managed to avert bankruptcy only after being allowed to restart its remaining nuclear unit and stop buying as much (very expensive) replacement power for its customers. TEPCO in the last five years has been forced to agree to decommission the two undamaged units at Fukushima Daiichi; the fate of its four units at Fukushima Daini, miles to the south, is unclear but know this: Fukushima Prefecture has stated repeatedly that no nuclear plant will again operate on its soil, and it's sure as the sunrise that eventually TEPCO will have to write off Fukushima Daini as well. Of course, there is one other TEPCO nuclear plant -- the massive Kashiwazaki-Kariwa nuclear plant on the opposite coast of Japan, and into which the owner has poured millions of dollars worth of upgrades and backfits and modifications to get it ready to pass NRA's inspections to start up. Given the public mistrust of TEPCO, it may well be that a contract operator will need to be brought in to "assist" TEPCO in starting up and operating the plant (Units 6 and 7, the two new ABWR's, would be first) until such time as TEPCO has regained a grain of public trust. Much has been made in the way of comparing the Fukushima Daiichi accident to the Three Mile Island and Chernobyl nuclear accidents, and now this recent name has joined the others on a short list of events that have reshaped an industry. Parallels to the Chernobyl accident from an operational and business standpoint are few; the Soviet system was, as much as anything, responsible for and conducive to a situation in which that particular accident occurred, and there are so many systemic (political and operational) as well as physical differences between the old Soviet plants of that era and Fukushima's plants that comparison is more wasteful than helpful. In terms of the 1979 Three Mile Island accident, there are a few further parallels. Neither accident directly caused the death of anyone. Both saw the burn of hydrogen generated in the accident, but the effect in the strongly built containment of the TMI plant was nil outside the containment itself. Not so, as we've seen, at Fukushima. In both cases too, we have seen that it was several years in and still no one was exactly sure what the condition of the melted nuclear fuel was. In the case of the heavily damaged Fukushima plants, it will certainly be longer to find that out than it was at Three Mile Island. Bringing back in Chernobyl for just a moment, the condition was suspected early and known fairly soon and was considered so bad that it was better to bury the destroyed reactor under lead and chemicals, and then build an enclosure over it; another, further outer enclosure is now being added. Fukushima Daiichi will not see this fate, it is almost certain, making it between the TMI and Chernobyl experiences in terms of the cleanup. 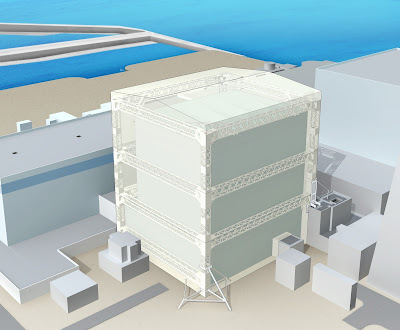 Fukushima Daiichi Unit 1 enclosure, courtesy Tokyo Electric Power Co.
Just this week, after Kansai Electric Power had been allowed to restart its Takahama 3 and 4 units, it was ordered by a Japanese court to shut them back down. This court action took place completely outside the nuclear regulatory atmosphere, and gives a clear message that nuclear restarts in Japan will from this point on be exceedingly problematic until a precedent is set (as we have in the US) that regulation of nuclear plants, and the determination of their safety, is a national (Federal) matter and is limited in scope to the nation's nuclear regulator alone. The Japanese government and the vast majority of corporate entities are heavily for restarting reactors, to cut fuel costs and to get the Japanese economy (read as "export machine") moving again. Various prefectures are for this, while some others aren't sure and still some others (Fukushima) are dead set against any interior or adjoining nuclear operation if they can help it. To the extent that they can, antinuclear forces are also trying to call into question every possible tiny defect in the earth as an "active fault," so that any reactors near them cannot be operated -- this is the case in a number of places, and legal actions continue. We certainly can say this: The nature of the nuclear plant operations in the future in Japan cannot yet be augured with any sense of surety. The Fukushima Daiichi accident did change very many things, but in one certain parallel to the Three Mile Island and Chernobyl accidents, it did not and cannot kill off nuclear energy. In none of these cases did worldwide overall opinion swing against nuclear energy. It continues to be considered as vitally necessary in many places today -- and, as the environment takes on more importance every day, the fact that nuclear plants produce no exhaust or gaseous emissions makes them a very significant force in "clean energy." While the nuclear entities around the world have much to do in terms of messaging, of ensuring communication with the public, and with gaining public trust, a great deal of that work has already been done simply by acknowledging the need for clean (low or no CO2,) reliable power. It is on that cornerstone that the future of nuclear energy is being built. 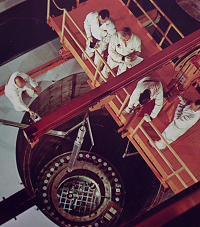 This step marks the first time since 2006 that a real chance exists that the ship will move forward with dismantling and decontaminating all portions of the power plant and auxiliary spaces, leaving the ship eventually roughly 7 years down the road with the nuclear license terminated, and thus no longer under any NRC obligations. 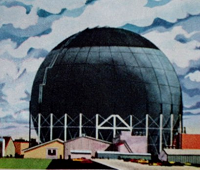 It must be noted that the present plans for dismantling the nuclear plant do not include damaging or removing any other significant structures, or historic spaces, on board the ship. We will be presenting more detailed information on the work to be done in the coming days. NS SAVANNAH holds three significant recognitions: The National Park Service declared the ship a Historic Landmark in 1991, and two professional organizations (the American Society of Mechanical Engineers and the American Nuclear Society) have recognized the ship as an International Historic Mechanical Engineering Landmark and a Nuclear Engineering Landmark, respectively. The ship is the sole physical remainder of President Dwight D. Eisenhower’s famous “Atoms for Peace” program intended to spread the economic, commercial use of nuclear technologies. It is significant to note that the Maritime Administration has stated that the desired outcome of the program is the eventual preservation of the ship.